One of my favorite parts of being a travel consultant is getting the opportunity to help my clients plan one of their “bucket list” trips. I get a huge adrenaline rush when Greece is the destination of choice! There are countless ways to experience this beautiful country, however I highly recommend choosing three to four areas and immersing yourself for at least 2-3 nights in each spot so that you can explore on your own and experience the local culture. My top picks for Greece are Athens, Santorini & Mykonos. Athens is rich in history and a wonderful starting point for your trip. 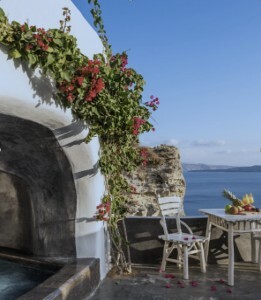 I recommend planning at least two days here and selecting one of my partner hotels that offer rooftop dining and incredible views of the Acropolis. For the mythology fans out there, a day trip to Delphi is a must see as you soak up this UNESCO World Heritage Site and all it’s fascinating tales. If you want to dance the night away and soak up some beautiful beaches as well as charming countryside, a great next stop would be the island of Mykonos. You can reach Mykonos by high speed ferry or a short flight. So many charming accommodations to choose from in Mykonos Town or along the beachfront as well. There are countless nearby islands you can explore by joining a boat tour or renting a private yacht for a day of snorkeling and relaxation. And of course a trip to Greece is not complete without a visit to the dreamy island of Santorini. One of my favorite properties for honeymooners (which is listed in the picture above) is built into the caldera and offers private pools, sunset views and simply stunning accommodations. Make sure to plan at least six months in advance as these unique spots are the first to sell out. With hiking trails, customized wine tours and sunset catamaran cruises, Santorini is always a huge hit. Are you ready to make your dream trip a reality? Text or call us at Travel Happy Agency, 513-275-8086 7 days a week.